Book now the best shore excursions in Portofino. High quality and safety at the lowest prices. If your are looking for Shore Excursion Portofino, book now the best guided tours at lowest price with Ancora Tours. Since 2003 we offer you official guides in english, transportation and travel insurance, all included. The highest quality at the lowest rates. 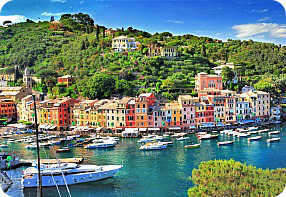 Portofino, founded by the Romans, has turned from an Italian fishing village into an upmarket resort. The beauty of this picturesque little town attracts international visitors and celebrities such as Rihanna, Leonardo DiCaprio and Beyonce. Book a Portofino shore excursion and see its beauties and nature. Price: €33 from Genoa, €39 from Savona. holidays and evenings. Reduced: for children 5- 10 accompanied by parents with round-trip ticket. Child up to 5, free. Rates are subject to change. What’s eating: Bagnun soup: made with fresh anchovies, onions, tomatoes, extra virgin olive oil and dry bread. Souvenir: A packet of Trenette pasta (similar to linguini) and a bottle of Ligurian olive oil. From either the port of Genoa or Savona we’ll drive towards Santa Margherita Ligure where we’ll take a boat to reach Portofino and begin the shore excursion. First, lets visit the Church of Saint George, a Romanesque structure from which we can see beautiful views of the town. Inside we can discover the relics of the city’s patron saint, which according to folklore, were recovered by fishermen of Portofino, returning from the Crusades. Next our Portofino shore excursion will check in at Castello Brown; now a museum and exhibition space situated atop the harbour. Built in 1557, this was an important fortress for Portofino, defending the city from attack until it was abandoned in 1815. Purchased at the end of the nineteenth century by Sir Montague Yeats Brown, it underwent various architectural transformations such as raising the towers and the addition of a roof garden. At the end of the Portofino shore excursion, we’ll head back to Santa Margherita Ligure and then drive back to port for boarding.